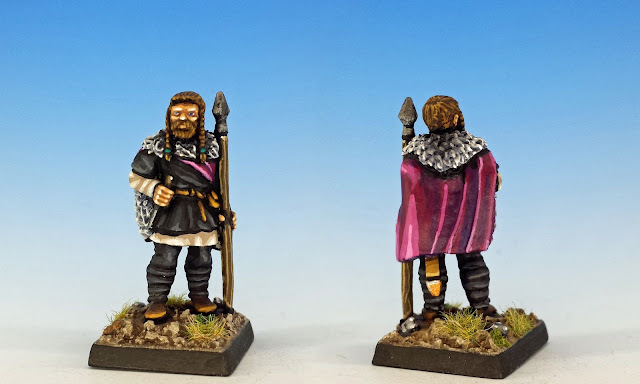 Here's the second half of my Viking warband for the skirmish game, Saga. 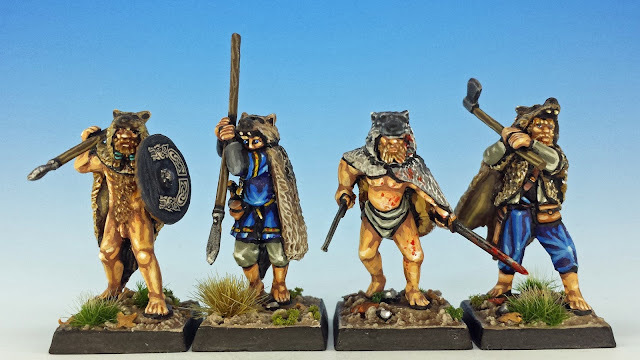 Last week we looked at the rank-and-file warriors ("Bondi"), and today features their warlord, Gaukur Trandilsson, with his inner circle of elite warriors: four hearthguard ("Hirdmen") and four raving, inadequately-clothed berserkers. Gaukur is the only miniature in my warband that wasn't made by Gripping Beast. I wanted a very special miniature for my leader, and eventually I found just the right lump of lead over at Wargames Foundry: "Big Lud Headsplitter" from their Viking range. 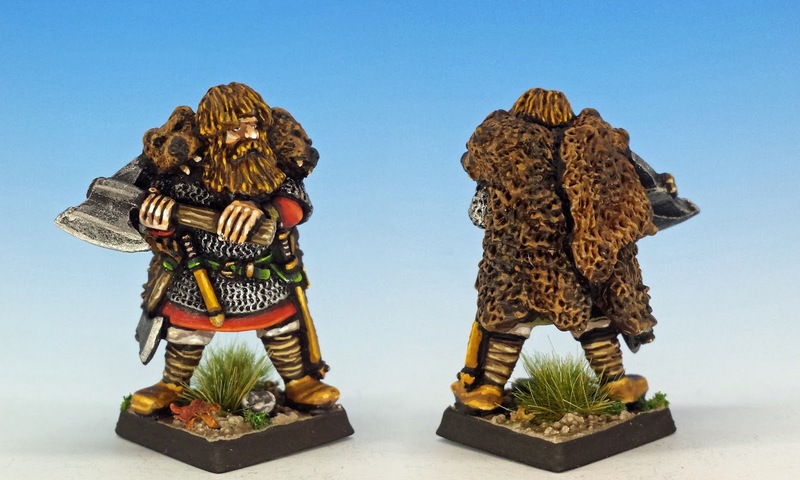 He is a giant among 28mm miniatures, with a shaggy head of hair that merges into two overlapping bearskins. He immediately reminded me of the prodigiously large and strong Egil Skallagrimsson from Egil's Saga. But what I loved most of all is his phlegmatic countenance (something I tried to highlight by giving him a heavy-lidded and almost weary expression). 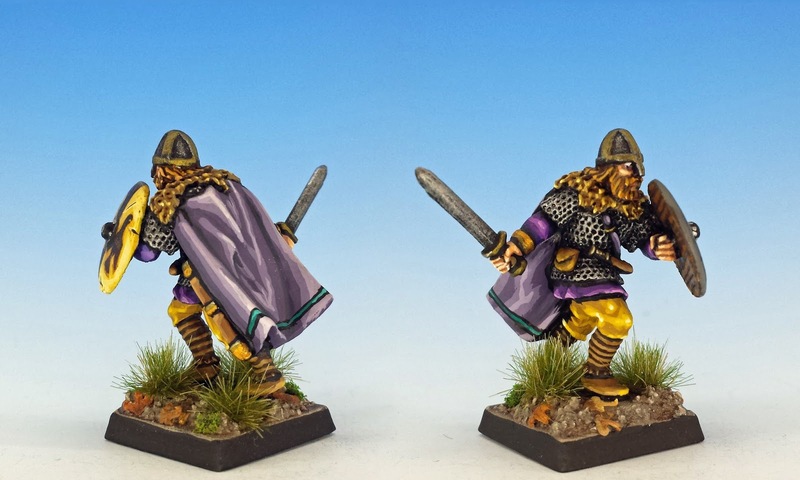 I've named him "Gaukur Trandilsson" because Gaukur's Saga was an important Icelandic Saga, but it has been lost to history. We know almost nothing about the real Gaukur, so it gives me a broad canvas to recreate his history. As I see it, Gaukur grew up in Norway around 1000 ce, the son of a wealthy "hersir" (or war-leader). Despite his great size and strength, Gaukur was considered an "ash lad" -- that is, a drowsy loner who seemed more interested in stirring the ashes in the hearth than helping around the estate or playing at ball-sports. 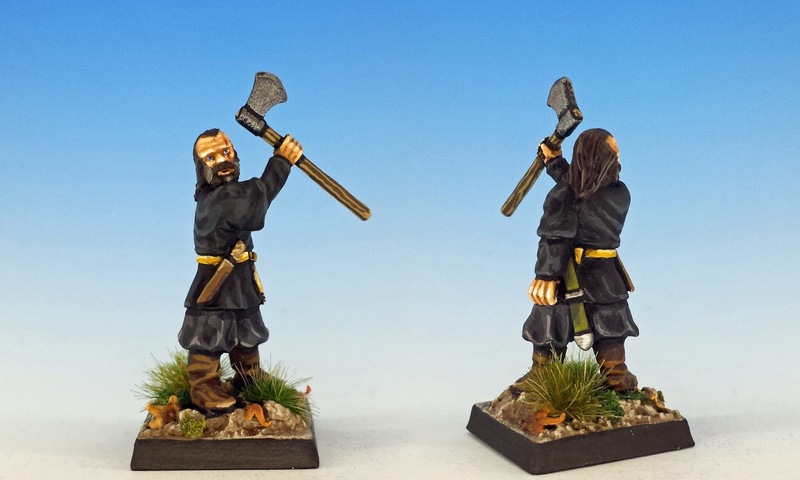 However, when his father was exiled for resisting the Kings of a unified Norway, Gaukur finally roused himself, slew some of the King's men, and led his father's old retainers on a series of profitable raids around the Channel Isles. My games of Saga will chart Gaukur's progress on these expeditions. So let's meet some of these retainers! They may be older, but they are also violent and crafty. 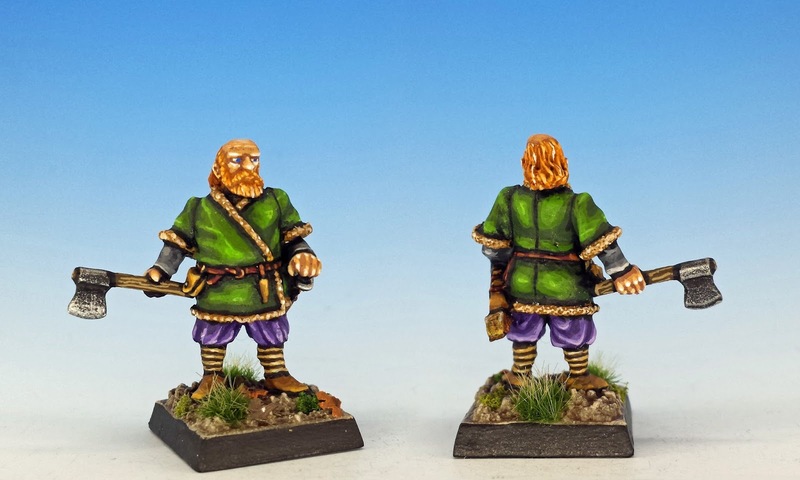 As Gaukur's inner circle of lieutenants, I wanted to convey experience, wealth and status with these miniatures -- hence the bright colours, trimmed fur and thoughtful expressions. At the other end of the spectrum, however, we have the four berserkers. 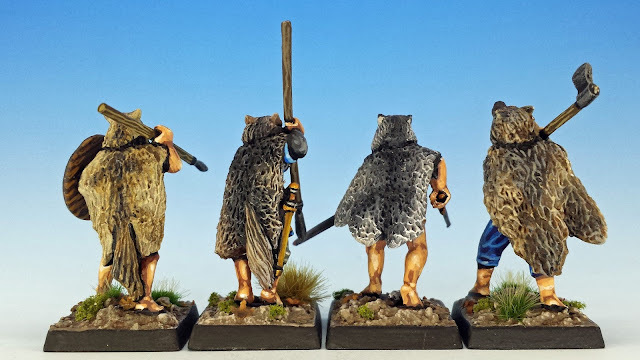 These are also elite hearthguard in the game, but true to their mythical descriptions, they fight in their negligee. 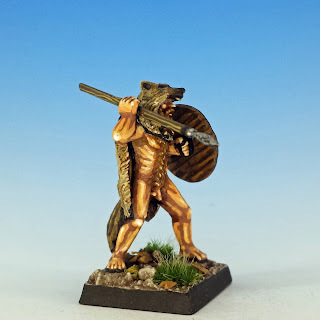 As Snorri Sturluson writes in the Ynglinga Saga, such men "rushed forwards without armour,were as mad as dogs or wolves, bit their shields, and were strong as bears or wild bulls, and killed people at a blow..". Now we just have to find Gaukur and his boys some opponents... hmm, I wonder what they will find waiting for them when they go to raid the Channel Isles? Thanks for not looking too closely! Great job again! I love the colors you used. You also see that you had some "fun" with matching weapons in the Berserker. It was similar to me. thanks Michal! The berserkers were a ton of fun to paint! Good luck with your basement. Renovations are such an incredible pain. Can't wait to see what you do with your own Vikings. Lovely job on a terrifying bunch! Fantastic! Really makes me want to break out my Saga's I have a few books hiding somewhere. 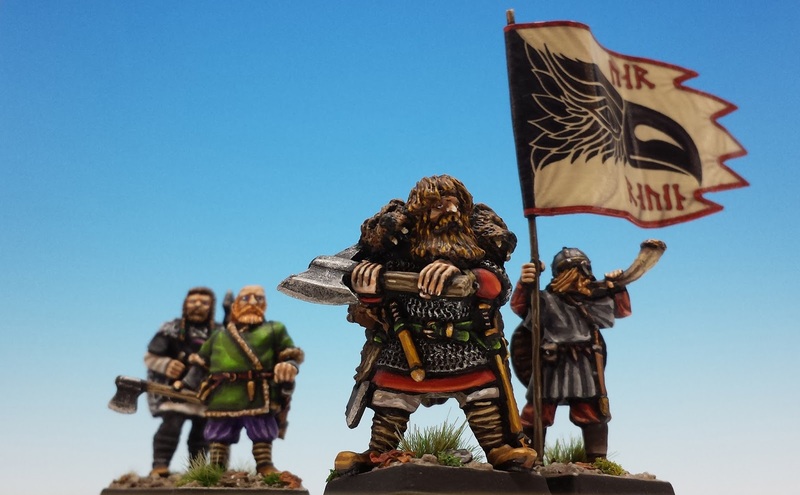 I also need to break out Age of Blood again and play out that warband I made. I'd be very interested in what you think of the Saga rules, Sean. And I am going to have to check out Age of Blood - I haven't heard of it. "when his father was exiled for resisting the Kings of a unified Norway, Gaukur finally roused himself, slew some of the King's men, and led his father's old retainers on a series of profitable raids around the Channel Isles." It's definitely time to rewatch Eric the Viking. I love that movie. Inspiring and excellent job Matthew, congrats! Brilliant work! I really like the colour choices that you've made for the individual models - so different, yet your style brings them all together. I'm glad you like the bright colours. I had a lot of fun with that - although it always takes me a devilishly long time to determine what colours to use. Your distinctive painting style works perfectly on these! Well I am chuffed. Thanks guys! Excellent and colorfull outcome!! Great job! Thanks so much! I'm looking forward to showing you all how they play on the table. Aw, these look ace mate. Love that you named them all too - perhaps I'll go back someday and do the same with my own Jomsvikings. Phew! Beautiful work, man! I love Gaukur's face!